Examining the global experiences, challenges and achievements of Muslim women participating in physical activities and sport, this important new study makes a profound contribution to our understanding of both contemporary Islam and the complexity and diversity of women’s lives in the modern world. 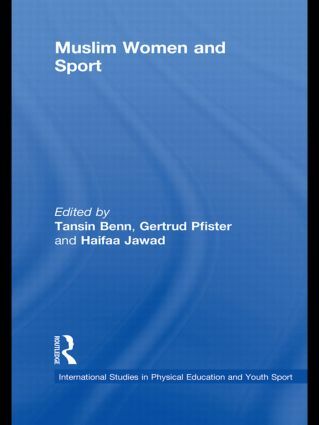 The book presents an overview of current research into constructs of gender, the role of religion and the importance of situation, and looks closely at what Islam has to say about women’s participation in sport and what Muslim women themselves have to say about their participation in sport. It highlights the challenges and opportunities for women in sport in both Muslim and non-Muslim countries, utilizing a series of extensive case-studies in various countries which invite the readers to conduct cross-cultural comparisons. Material on Iraq, Palestine and Bosnia and Herzegovina provides rare insights into the impact of war on sporting activities for women. The book also seeks to make important recommendations for improving access to sport for girls and women from Muslim communities. Muslim Women and Sport confronts many deeply held stereotypes and crosses those commonly quoted boundaries between ‘Islam and the West’ and between ‘East and West’. It makes fascinating reading for anyone with an interest in the interrelationships between sport, religion, gender, culture and policy.